Secretary of Defense McNamara announces reactivation of the 5th Marine Division. Manpower for the 5th MarDiv comes from the 55,000 spaces authorized for the Marine Corps in late 1965. BLT 1/26 is reactivated at Camp Pendleton and LtCol. Monti is assigned as its Commander. Capt. R. J. Weidner is the first Commander of Delta Co. The training cycle is a three-month "lock-on" which includes live fire exercises and an amphibious landing north of Oceanside, CA. U.S. Marines repel NVA Division 324B's invasion of Quang Tri Province in Operation Hastings. BLT 1/26 departs San Diego as part of a three-ship convoy consisting of the Iwo Jima, the Vancouver and the Thomaston. BLT 1/26 ships pass close by Mount Suribachi on Iwo Jima and Marines hold formation to pay respects. Delta Co. goes through jungle training school in the Philippines. Operation Hastings ends and the 3rd Marine Division launches Operation Prairie on the same battleground in response to a new invasion threat by the NVA 324B Division. Delta Co. conducts a training exercise in the San Jose Area, Mindoro Philippines Islands. BLT 1/26 makes its first combat landings in Vietnam during Deckhouse III, Parts I and II. The area of operations is The Vung Tau Peninsula, 60 miles southeast of Saigon. The landings are made in conjunction with the 173rd Airborne Brigade and Australian units. The target area is the coastal lowland of Binh Tuy and Phuoc provinces, generally an uncultivated plain covered with one and two canopy jungle and swamps. The rifle companies operate over widely separated areas, relying on small unit patrolling to adequately search the area. The enemy forces targeted are the Headquarters VC 5th Division, 274 and 275 Main-Force Regiments, which are seeking to avoid engagement. General Westmoreland visits the CP for BLT 1/26. Deckhouse III, Phase I, is the first combat landing in Vietnam for BLT 1/26. The 1/26 Battalion CP is located at grid YS 829714. There is no significant contact on this landing during the sweep of this plantation territory. Deckhouse III, Phase 2, Operation Toledo, is the second combat landing in Vietnam for BLT 1/26 (August 22 to 29). The 1/26 Battalion CP is located at grid YS 645700. The operation locates and then attacks a VC base camp and bunker complex. The VC do not stand and fight; instead, they abandon the base prior to the Marine attack. However, the results of the sweep are good, as tons of rice are captured along with ammunition and other supplies, such as a tractor and cattle. Three C/1/26 Marines were killed on August 28, 1966 and they are the first combat deaths for 1/26 Marines. LCpl. Randall Lake, date unknown Died of malaria contracted during Operation Deckhouse III, Phase 2. 3/4 Marines attack the elaborate fortifications being constructed by 324B along a ridge near the razorback as part of Operation Prairie. Hills 400 and 484 are the Marines’ objectives in the battle for Mutter Ridge. In related actions, BLT 1/26 is OpCon to the 4th Marines and conducts Deckhouse IV/Prairie at the same time. Deckhouse IV/Prairie starts when BLT 1/26 Marines makes its third combat landing as a reconnaissance in force sweep in the area north of Dong Ha. The target is the northwestern portion of the Gio Linh District, and the mission is to screen the northern approaches in support of Operation Prairie. During this operation, BLT 1/26 engages in a series of fights with units of the NVA 324B Division northeast of Con Thien. The Reconnaissance unit attached to BLT 1/26 was 1st Plt., Co. A, 5th Recon. Elements of this unit engaged the NVA and 1st Lt. W. J. Spainhour was killed. Delta Co. moves out to the northwest after securing the LZ for the CP of BLT 1/26 near the Village of Phu Tho. From the company's night position, the Ben Hai River Bridge checkpoint to North Vietnam can be observed. In the early AM, Delta Co. comes under mortar fire. Later in the day, two bobby traps explode and several casualties are medevaced. In the early AM hours a large firefight starts not far away and continues for quite a while. The firing is from the Alpha Co. position as they are being attacked by NVA with heavy small arms fire and mortars. Delta Co. moves out in the morning in a westerly direction through rolling terrain towards the village of Gia Binh. This village is northeast of Con Thien (Hill 158), which is then an ARVN outpost. At midday there is occasional gunfire in the distance. In the afternoon, the company goes through what is basically a large bamboo forest, which takes a while to traverse. The north end opens up on a small rice paddy the village on the other side was Gia Binh. The point of 2nd platoon sees NVA soldiers and heavy fire erupts. Delta Co. advances and the surprised NVA pulls back. The 1st Platoon draws the point next, and Delta Co. moves out in a northerly direction along the cart path, which runs through Gia Binh. After a short advance, the NVA strikes back with heavy fire from fortified positions on both sides of the road (YD 146730). The company returns fire, and air strikes and artillery are called in. The company recovers casualties and pulls back to set up a LZ. Late in the afternoon, a medevac helicopter is shot down while trying to land. The company digs in for the night. In the early AM hours, Delta Co. comes under mortar fire. The morning advance into Gia Binh begins with the 2nd Platoon as point. The plan is for one squad to advance towards the center of the village along the main trail flanked by the other two squads. The physical setting is tough, with hedgerows limiting movement; the previous day's probe towards the center of the village revealed a series of trenches, tank traps, and fighting positions. Late in the morning, the company makes heavy contact and receives automatic weapons fire from both sides of the road and the front (YD 146730). The enemy fights from prepared positions and the 2nd Platoon takes very heavy casualties. Several Marines are killed in the initial exchange of fire, including the 2nd Platoon Commander, 1stLt. Geoghegan. There is a lot of confusion on both sides, with the NVA calling out to each other and Marines doing the same. Delta Co is pinned down for quite a while; supporting arms, along with the eight-inch guns of the Navy cruiser St. Paul, are called in to cover its withdrawal. 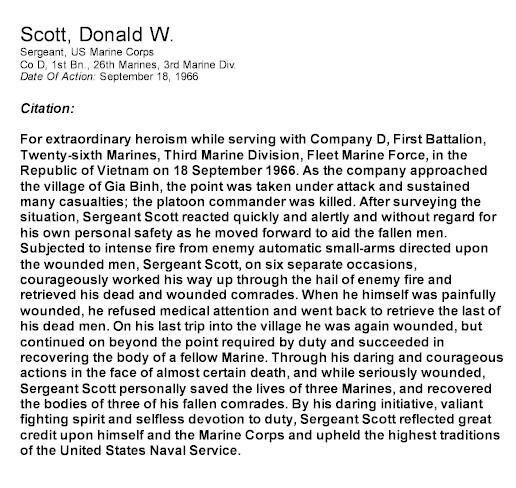 Sgt Donald W. Scott was awarded the Navy Cross for his actions and valor on September 18, 1966. In the morning, Delta Co., reinforced with a platoon from Bravo Co., attacks the village of An Dinh, which is the connected village south of Gia Binh. The village of An Dinh is located east of Con Thien. The company advances, comes under fire, and is heavily engaged (YD147717). Supporting arms saturate the area. Delta Co. attacks again and runs into heavy fire. Air strikes are called and produce secondary explosions. Pfc. Bruce Backeberg (KIA 9/9/66) and Pfc. Edward D. Larson (WIA-9/21/66 and DOW-10/8/66) were awarded the Silver Star (Posthumously) for their actions and valor on September 19, 1966. An attack by three companies is initiated against An Dinh. In the morning, Charlie Co. and the tanks attack from the west and meet strong resistance from automatic weapons and AT rockets. Air strikes and artillery are called and Delta Co. maneuvers to linkup with Charlie Co. on the left and Bravo Co. on the right. That afternoon, Companies B, C, & D, supported by tanks, attack the village from three directions. An Dinh is secured when the NVA force break contact at the end of the day and pull back to the north. Delta Co. receives early AM mortar fire. A renewed attack against Gia Binh is commenced in the morning. Delta Co. advances northward and receives scattered small arms fire from the village. However, this time the NVA do not put up a fight and withdraw. The company enters Gia Dinh at midday. A sweep of the village is conducted, especially the area where Delta Co. fought the NVA on September 17 and 18. The company uncovers 17 NVA bodies, an extensive trench network, bunkers reinforced with concrete, and many spider holes. This place became known to Delta Co. as the three gates from hell. In the morning, Delta Co. advances towards Con Thien (Hill 158). Bravo Co. makes contact with the NVA west of Gia Binh. A local woman states that two NVA platoons have just passed through the area and are accompanied by Chinese advisors. The Marines of BLT 1/26 reembark aboard the ships of the SLF. As September ends, the total NVA killed in Operation Prairie are 943. The number of NVA killed during the ten days of Deckhouse IV/Prairie fighting is 254. BLT 1/26 casualties are 36 KIA and 200 WIA, and Delta Co. losses are 12 KIA and several dozen WIA. This includes the following Delta Co. Marine who latter died of wounds. The battalion goes ashore at Da Nang to replace 1/9 at Hill 55 TAOR south of Da Nang. 1/26 is placed under the operational control of the 9th Marine regiment. After completion of Operation Deckhouse IV/Prairie, the decision is made to strengthen the Marine presence on the DMZ. In October 1966, the Marines of 2/5 take over Con Thien from the ARVN.